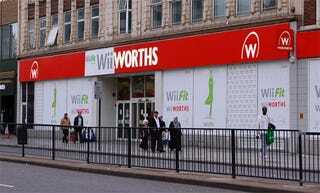 The rolling thunder of the Wii Fit marketing program hits another target, as UK high street chain Woolworths gets re-branded as "Wiiworths" and plastered with the game's trademark color scheme. It's not the only getting Fit, as our friends at Nintendo tell us the Hyatt Hotel in the heart of the LA's Sunset Strip is also going to be a shining beacon of promotion. We're heading down to snap a pic—unless you've got one already, readers—so we can bask in the glory of giant advertising. We expect to see a Wii Fit tattoo by next Wednesday.